You know how I love challenges. I do. But lately I have so many things in life that I no longer have time to write proper reviews for this blog as usual. I keep reading, though not as much as I have expected. But the reviews are the most challenging part right now. 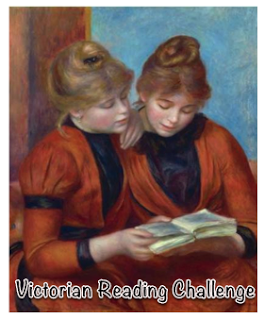 So, I am very excited to find this Victorian Reading Challenge, firstly because it doesn’t require you to make reviews (yay...thanks Becky!). Secondly because Victorian literature is my favorite, and although I have vowed not to plan my reading for next year, well… I just can’t resist of having a reading list! It’s in my blood, I guess. Like, not knowing what I should read next can make me unsecured. Is it normal? LOL… Anyway, after consulting my reading list, and found that there are several Victorian books in it, I decided to join in. If you are interested too to do this challenge, find out more of the list and rules in Becky’s blog. I always love to read Dickens, and have meaning to read all his books. The opening is really dark, so at first I was afraid it would be as dark as The Mystery of Edwin Drood. But it turned out to be not that dark after all, although it’s still quite mysterious. Gaffer Hexam found a body drowned in the river, and it was believed to be John Harmon’s. Harmon’s father has inherited his assets to John on condition that he must marry a poor girl named Bella Wilfer. 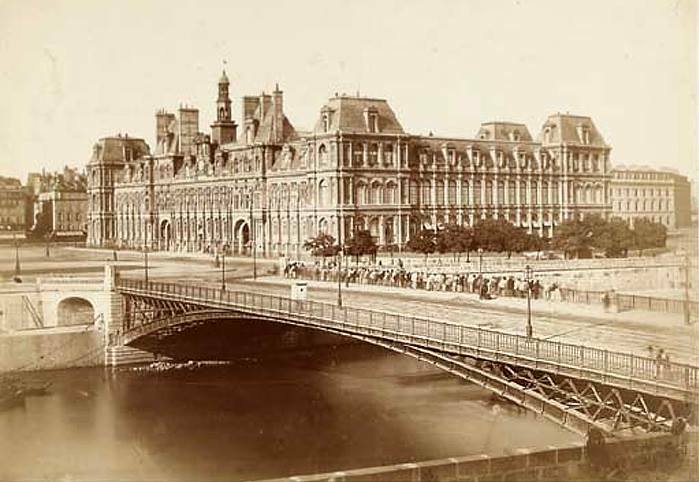 It was on his way back home to London that John Harmon was drowned. That was only a summary for first chapter. Then the story unfolds to so many characters and background stories, that you can’t put it down too long without the risk of losing track of the story. See…. Dickens is always perfect for December reading! Eugene Wrayburn, the barrister. From his first appearance, I was at once in love with his straightforward, laid back and insolent character. Definitely! I am now in page 400s, and this book is becoming more and more interesting. Although the mystery around John Harmon has been slowly unfolding, it’s still interesting to see what would happen to the main characters. Finger-cross for the happiness of Lizzie Hexam! As with all Dickens’ stories, I think it will end up good for the poor and honest lots, but the hypocritical ones will suffer. So, how is your December reading so far? For years I have a soft spot for Ancient Rome. Few years ago, after reading Robert Harris’ Cicero series (Imperium & Lustrum), I fell in love with Cicero, who is, probably, the greatest orator of all time. So I googled some of his works, and found this one. Maybe US Presidential debates had something to do with it, LOL!... Anyway, I’m reading it for my Classics Club challenge. It was quite intimidating, considering how long speeches usually take in Roman court (from books I’ve read). And I was rather disappointed in finding that Catiline’s case wasn’t covered in this book. But then I remembered, this is Cicero’s defense speeches, while in Catiline’s case he was the prosecutor. Sure, it turns out to be quite interesting! 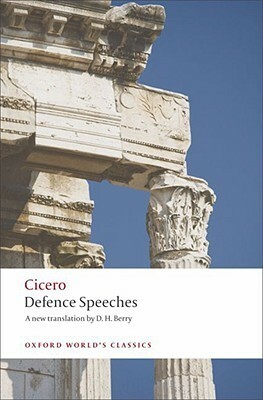 I am still in the first (of five cases), and I have been amazed by Cicero’s eloquent yet sharp oration. And so, after one tedious reading above, The Belly of Paris felt like a relieving balm. Zola must have done many observations and data collections to create such a methodical list about food and dishes inside the story. And look how he composed the “orchestra” of cheeses, or made fruits to become parts of girl’s body parts…. Zola is just that genius and artistic writer, isn't he? And that makes me loving him even more! The Belly of Paris also let us getting introduced to Claude Lantier, although this time he did not have important role to the story. 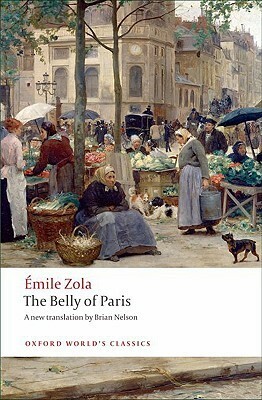 Overall it’s nice, only sometimes Zola got intense in highlighted the gluttony of Paris, that it gets disgusting. Do not read this book before or while you’re eating! I’m not quite a fan of short stories, but this one is just amazing. The Curious Case of Benjamin Button is the champion, of course. It was much deeper and more tragic than its adaptation (Brad Pitt as BB). I also liked Head and Shoulders, The Cut-Glass Bowl, and The Lees of Happiness. The last one is actually rather sad and sweet. Interestingly, the stories tasted a bit like Zola and a bit Dickens. 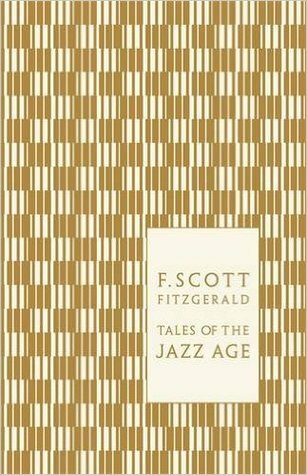 Fitzgerald’s descriptive narration reminded me of Zola, while his sense of humor was to me, a little Dickenish. In short, it does not have any similarity to The Great Gatsby or Tender is the Night. Tales of the Jazz Age is light, flowing, sweet, funny, but also sad and sometimes shocking. 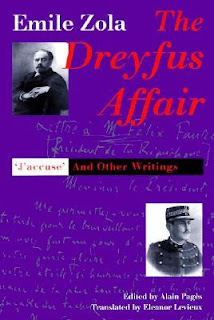 Being a non-fiction and chronologically compiled letters, writings, and even speeches, I thought The Dreyfus Affair would bore me. Well, it was for the first half, for it was compilation of Zola’s plea in letters and publication, pointing out Dreyfus’ innocence. The repetition was almost unbearable, until the open letter was up: J’Accuse! (action time! ); then it became interesting. The most powerful piece was Zola’s speech in his statement to the Jury about Dreyfus Affair. 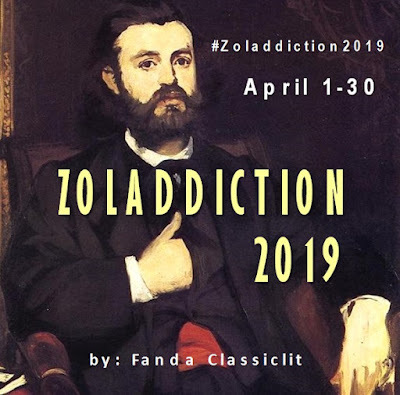 But his personal letters to his wife Alexandrine, his mistress Jeanne, and his friends were all really interesting; in that it reveals a bit of Zola’s personalities—his anxiety, his loneliness, and his ability to keep his focus in writing during the hard times. 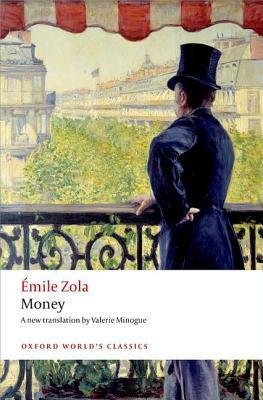 If you are Zola’s fan, or intrigued by his works, you are going to enjoy this book! Right now I am reading Proust’s Swann’s Way, but my progress is very slowly…. 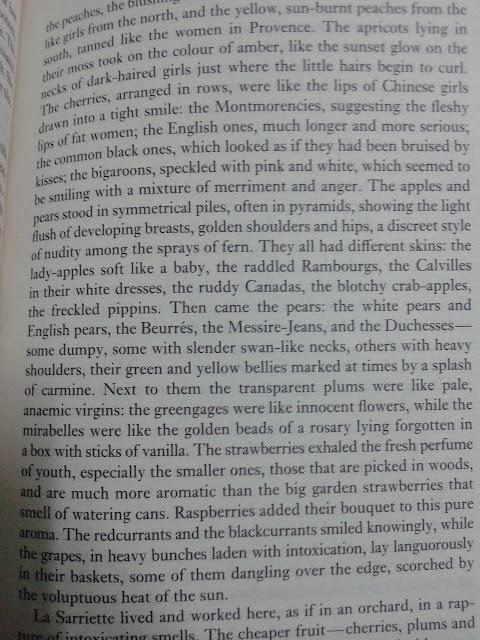 It’s not really enjoyable, but I must admire Proust’s beautiful prose. Jean Béraud (January 12, 1849 – October 4, 1935) was a French painter, noted for his paintings of Parisian life during the Belle Époque. He was born in Saint Petersburg. His father (also called Jean) was a sculptor and was likely working on the site of St. Isaac's Cathedral at the time of his son's birth. 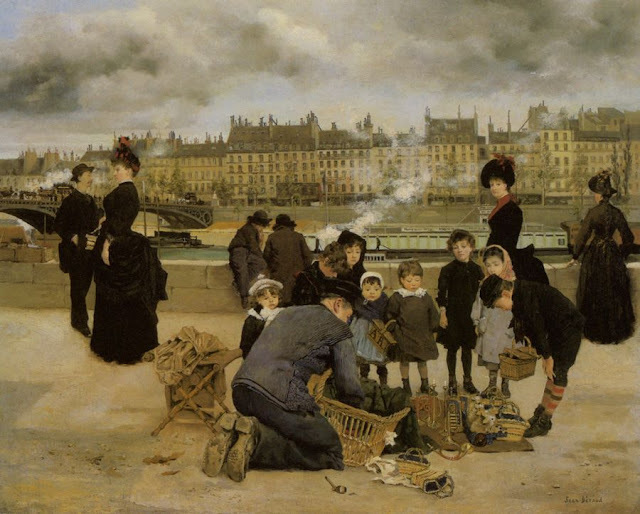 Béraud's mother was one Geneviève Eugénie Jacquin; following the death of Béraud's father, the family moved to Paris. Béraud was in the process of being educated as a lawyer until the occupation of Paris during the Franco-Prussian war in 1870. 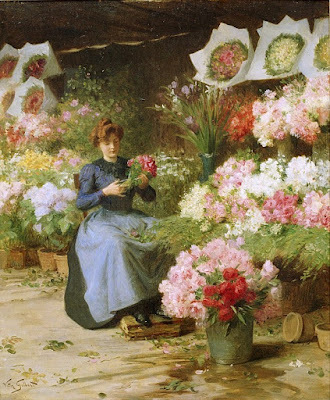 Béraud became a student of Léon Bonnat, and exhibited his paintings at the Salon for the first time in 1872. 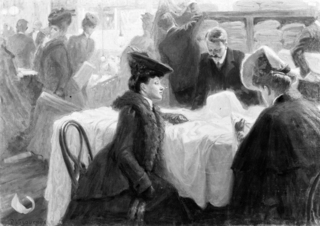 However, he did not gain recognition until 1876, with his On the Way Back from the Funeral. He exhibited with the Society of French Watercolorists at the 1889 World's Fair in Paris. 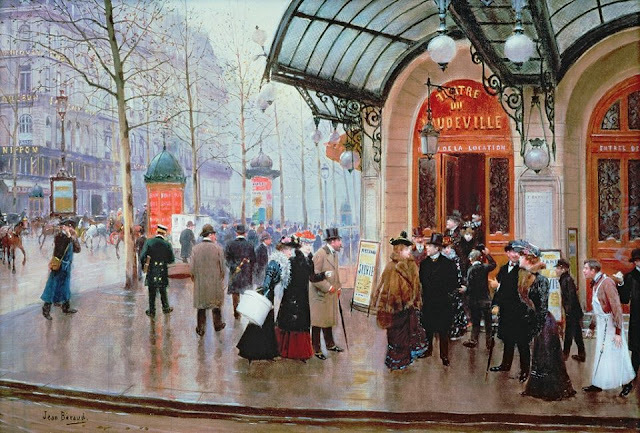 He painted many scenes of Parisian daily life during the Belle Époque in a style that stands somewhere between the academic art of the Salon and that of the Impressionists. He received the Légion d'honneur in 1894. 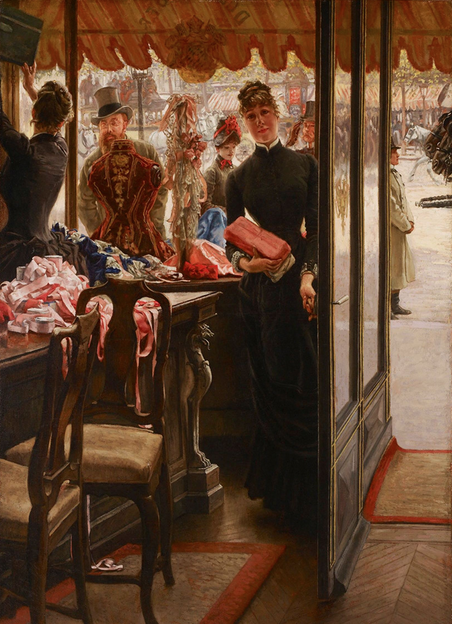 Béraud's paintings often included truth-based humour and mockery of late 19th-century Parisian life, along with frequent appearances of biblical characters in then contemporary situations. Paintings such as Mary Magdalene in the House of the Pharisees aroused controversy when exhibited, because of these themes. 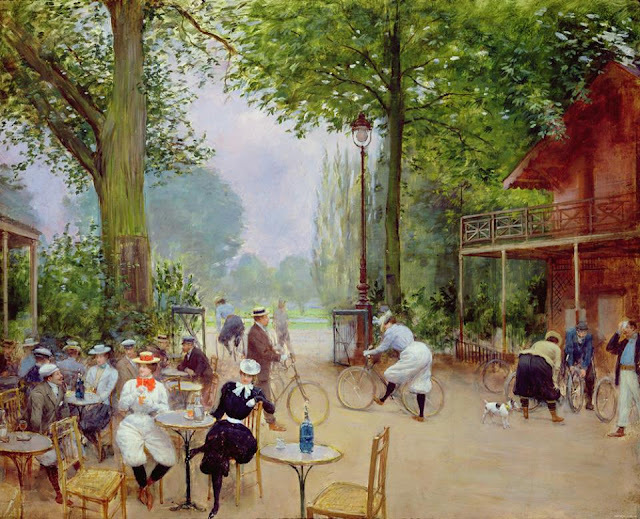 Towards the end of the 19th century, Béraud dedicated less time to his own painting but worked on numerous exhibition committees, including the Salon de la Société Nationale. 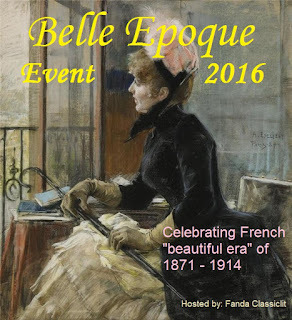 I posted this for my Belle Époque Event 2016, You will find more artists along the year. Fighting to Complete My Classics Club Project by Next Year! Okay, time flies, indeed, too fast! 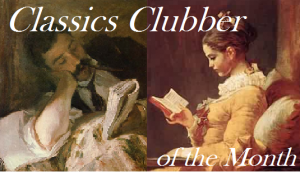 When I started The Classics Club Project in March 2012, five years seemed so far away, I believed this project would be quite an easy one. I was wrong! Yes, the first two years my progress was quite fast. 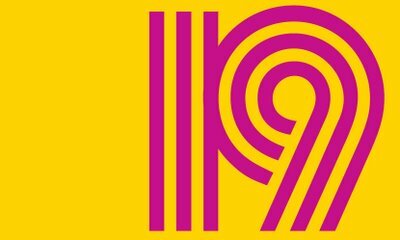 Since then I have updated and added a lot of books to my original list of 100. But today I realized for the first time, that my deadline would be 8th March 2017—only 10 months from now! If I still want to complete this project, I must work out very diligently…starting today. My current list is 165 (I know… I was too ambitious then! ), which is impossible to complete all in 10 months. With my current speed, 2 books a month, I think, is the most realistic. 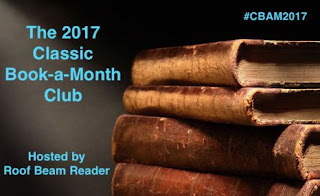 So, I trimmed down my list to 125, which means I have 20 classics to read by March 2017. It would not be an easy conquest—not with my current activities, plus I am selling our old family house and buying a new apartment this year. No, it would be very tight, but I’m prepared to push myself to the limit. Then, let’s see what I can achieve by March next year! 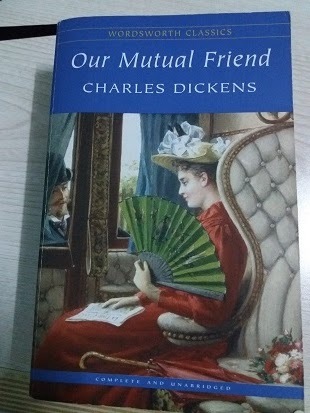 The Pickwick Paper, Dickens – currently reading, originally for o’s read along, but I decided not to follow the timeline, as I found it difficult to reconnect with the characters after leaving them for a month. 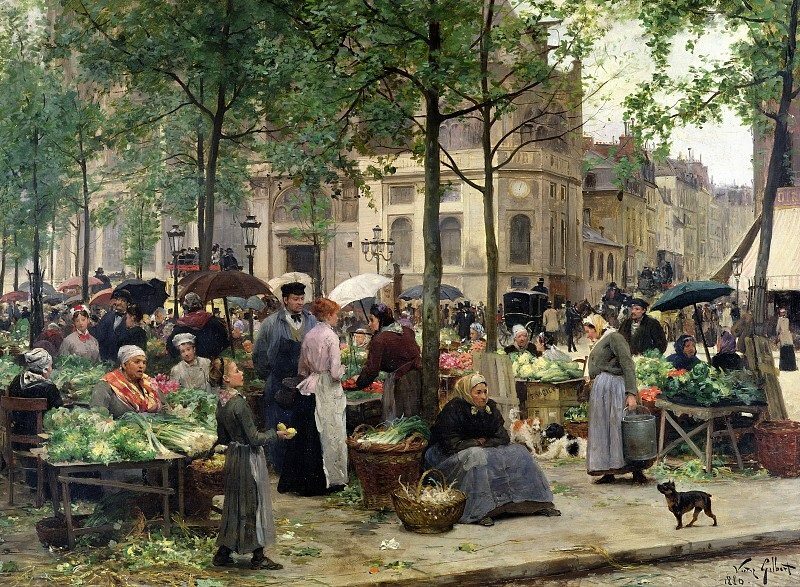 Victor Gabriel Gilbert (1847-1935) was a French painter of genre scenes. 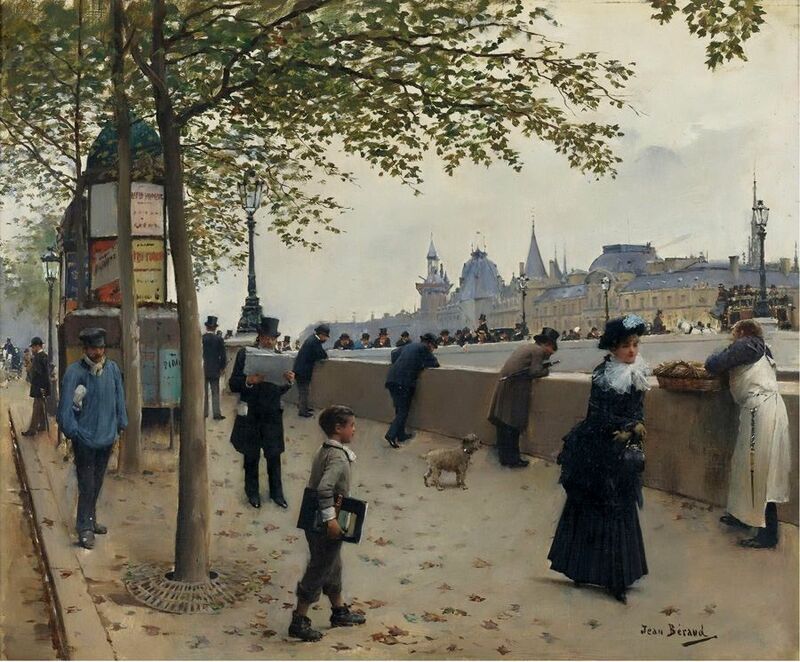 Gilbert was born in Paris on 13th February 1847. His natural ability for drawing was acknowledged at an early age but due to financial circumstances he was required to work as an artisan. He received his formal training from L. Em. Adan, Levasseur and Ch. Busson. In 1873 he had his debut at the Paris Salon and continued to be a faithful exhibitor at the Salon des Artist Francais where he obtained a silver medal in 1889, received the Bonnet Prize in 1926 and the Knight of the Legion of Honour in 1897. He was highly respected for his fine detailed work and was considered an inspiration to many artists. 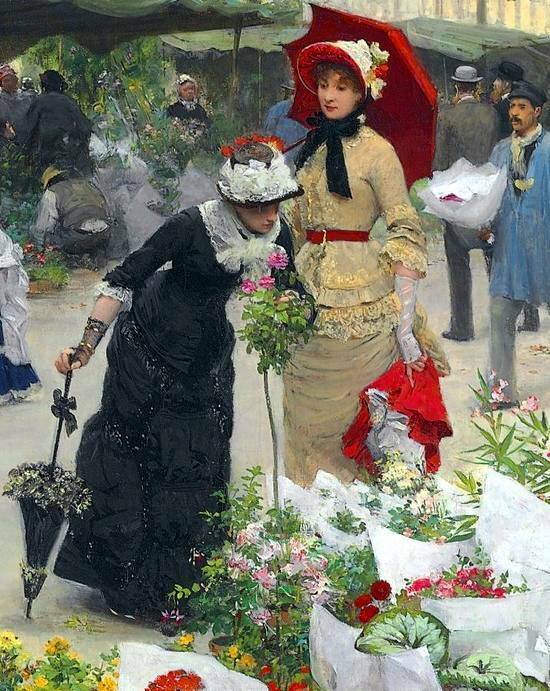 His views of the colourful Parisian life, the boulevards, cafés and flower stalls became well known. 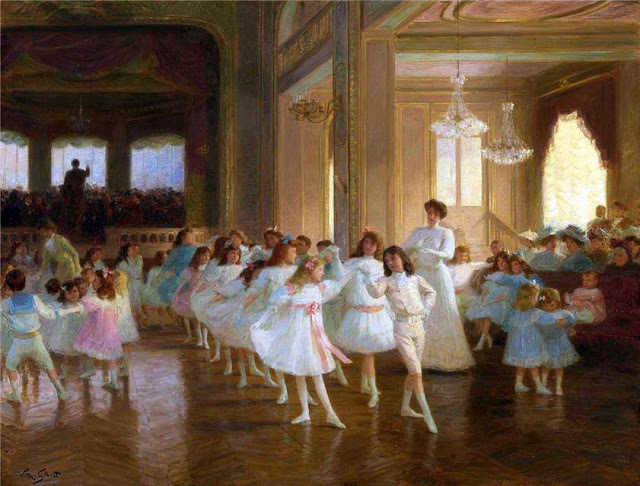 At the same time he turned his effect on the portrayal of adorable children, accomplishing a sensibility and great harmony towards his subject. It was during the mid 1870s that Gilbert became a close friend to Pierre Martin, one of the principal supporters of the impressionist movement and Victor Gilbert’s paintings secured a place amongst his collection of Impressionists like Monet, van Gogh, Cezanne and Gauguin. Victor Gilbert’s paintings were not only well sought after in France, he also exhibited in 1883 in Munich, 1894 in Vienna and he was a great success in London in 1908. Today his work can be viewed in the Museums of Bayeux, Besançon, Bordeaux, Dieppe, le Havre, Lille, Liége, Nice and Strassbourg. I posted this for my Belle Époque Event 2016, You will find more artists along the year; the next one will be up (hopefully) very soon! 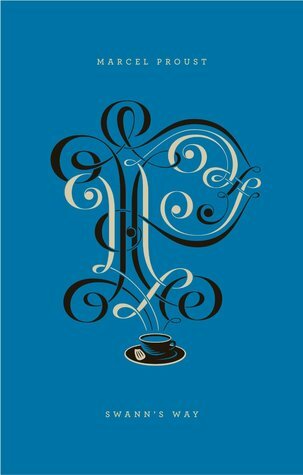 Reading Zola’s The Ladies’ Paradise gives me certain excitement which I have never encountered before from Rougon-Macquart series that I have read so far—it is the business aspect. The growing expansion of Octave Mouret’s first modern department store in Paris has awakened my own business instinct which has grown from my more-than-twenty-years of working in trading business. This is not a proper review of the book (for I am still half through it at the moment), but I was intrigued to give my personal advice to one of the shop owners whose business is threaten to be ruined by the Ladies’ Paradise. Old Bourras owns an umbrella shop. He used to have employees worked for him, and his specialty is carving the handle-knob with artistic subjects, which, I believe, gives his umbrellas a personal touch. But then Ladies’ Paradise opened its umbrella and sunshade department, selling umbrellas in much cheaper prices, and stealing Bourras’ loyal customers away. It gave old Bourras a terrible blow, but, does it really have to end that way? I personally do not think so. Me: “Dear M. Mouret, I have told you earlier, that I am no businessman. 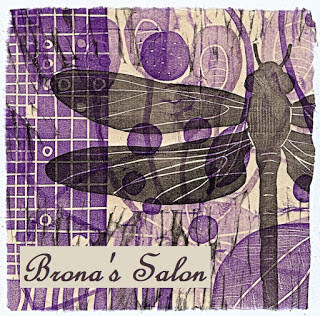 With this partnership, I will earn enough money for my business to keep going, and a humble living for myself. But mostly I will have pleasures from making beautiful umbrellas. It’s all what I need in this world. In a new turbulence era, we better face the changes with open mind. It is good to keep our principles, but do not let it bar our judgment. Creativity is the key, and always find a win-win solution! When a huge power dominates our society (in this case capitalism), don’t fight back! Or else it will crush you mercilessly. Open mind and creativity will give us better bargaining position. It’s a Very Outdated Post! I know it’s very-very outdated. 2015 was already far away… but I won’t ever forgive myself if I don’t, somehow, wrap up my last year Literary Movement Reading Challenge. You know, of course, that I failed my own challenge, but there are others who took efforts to read all, or at least most of, the movements. In the middle of my spare time during office hours—yayy… J--Ihave managed to count all participant’s posts (though I’m really sorry if I couldn’t read nor comment them one by one). From 22 who signed up, just a few managed to ‘survive’ to the last. And from the few, only ONE person completed the whole challenge, by reading at least one book for all movements; and I’m proud to announce that the winner of this challenge is…..
Congratz to Ruth—a very good job! I’m proud of you and your dedication for this challenge. I will contact you soon to arrange the prize. 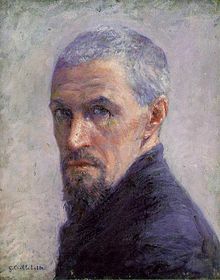 Gustave Caillebotte (19 August 1848 – 21 February 1894) was a French painter, member and patron of the group of artists known as Impressionists, though he painted in a much more realistic manner than many other artists in the group. Caillebotte was noted for his early interest in photography as an art form. Caillebotte's style belongs to the School of Realism but was strongly influenced by his Impressionist associates. 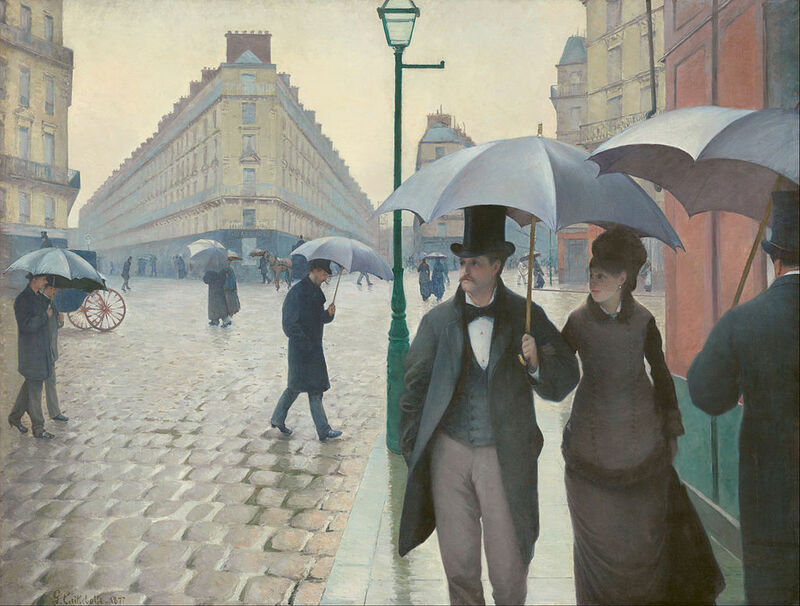 Caillebotte is best known for his paintings of urban Paris, such as The Europe Bridge (Le Pont de l'Europe) (1876), and Paris Street; Rainy Day (Rue de Paris; temps de pluie, also known as La Place de l'Europe, temps de pluie) (1877). 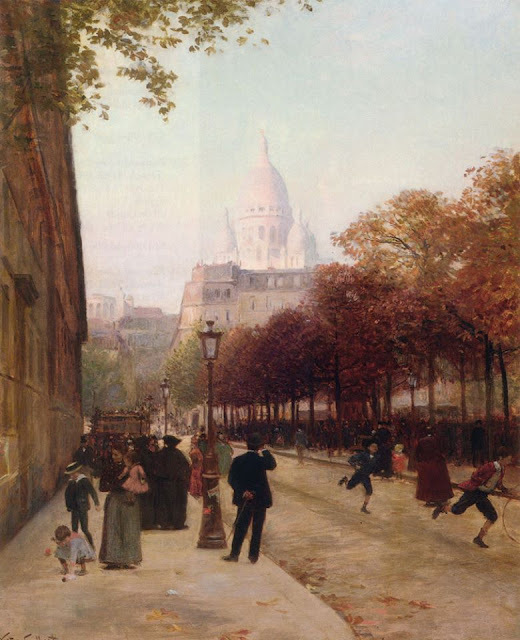 The latter is almost unique among his works for its particularly flat colors and photo-realistic effect which gives the painting its distinctive and modern look, almost akin to American Realists. 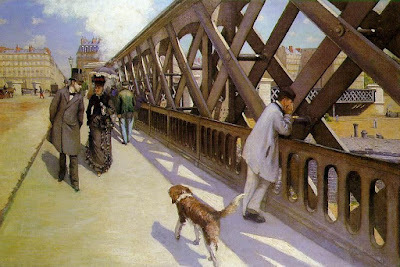 Showing little allegiance to any one style, many of Caillebotte's other urban paintings produced in the same period, such as The Place Saint-Augustin (1877), are considerably more impressionistic. 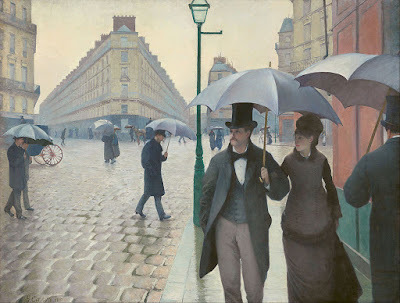 Gustave Caillebotte's paintings are not new to me... well, several of them, at least. Apparently, Oxford World's Classics used at least three of them as covers for Emile Zola's books. 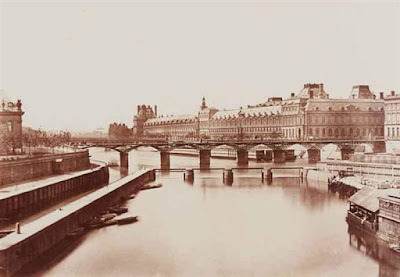 The "Paris Street, Rainy Day" was used for The Kill's cover, while "Le Pont de l'Europe" was actually picked by OWC as the cover of La Bête Humaine. 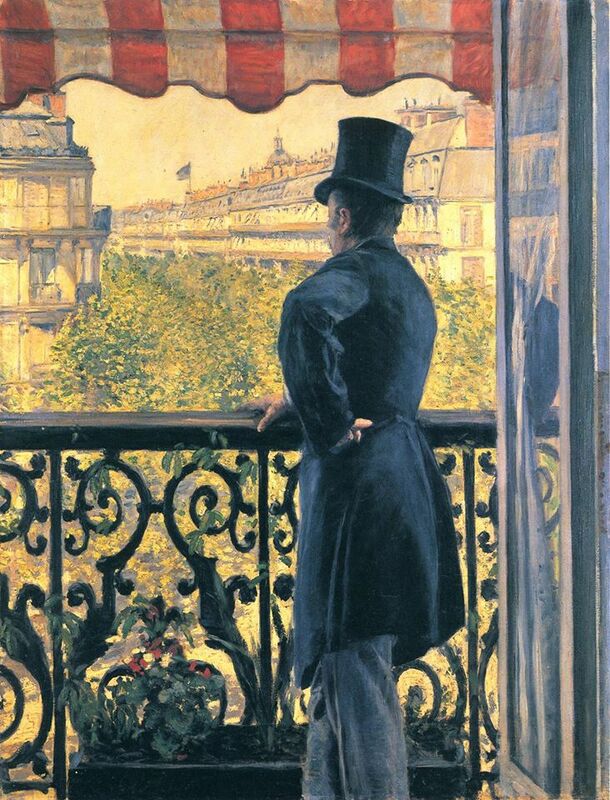 And if you own the latest edition of The Money from OWC, you will not be surprised to see that its cover was borrowed from Caillebotte's "Man on a Balcony". To me it's really nice of OWC to pick French Impressionist's paintings as Zola's book cover. 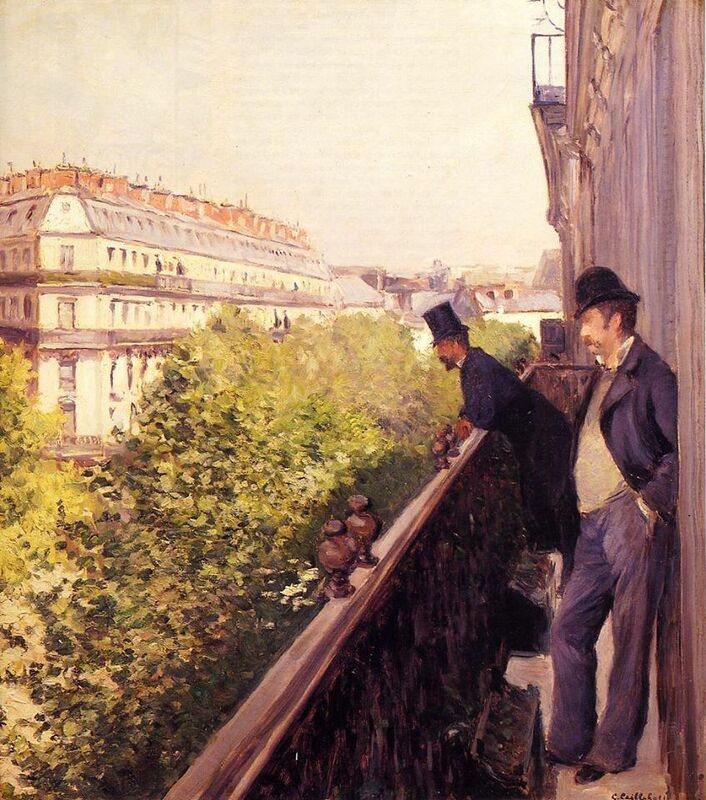 Zola was one of the supporters of Impressionism on his era anyway. I posted this for my Belle Époque Event 2016, You will find more artists along the year; the next one will be up in March! Édouard-Denis Baldus (June 5, 1813, Grünebach, Prussia – 1889, Paris) was a French landscape, architectural and railway photographer. 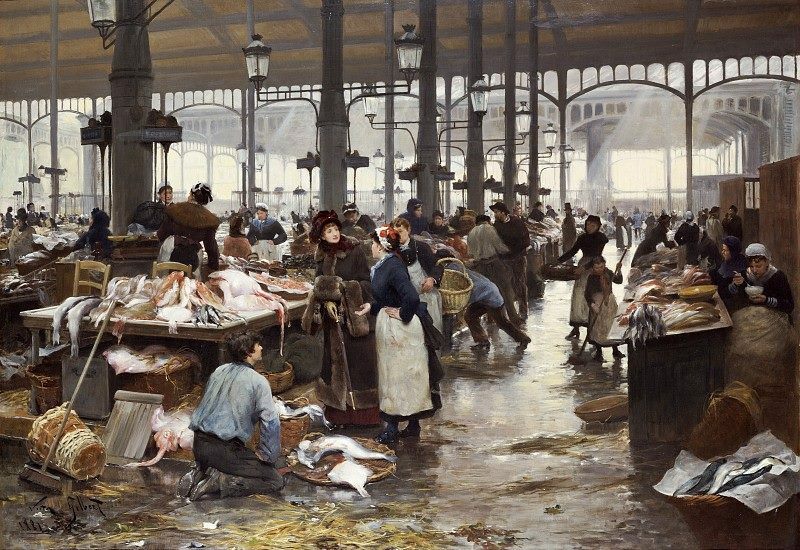 Baldus was originally trained as a painter and had also worked as a draughtsman and lithographer before switching to photography in 1849. 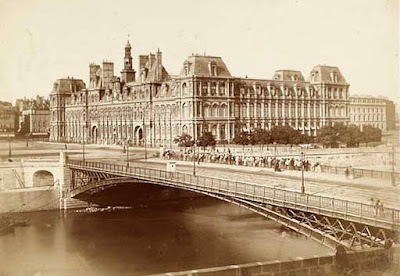 In 1851, he was commissioned for the Missions Héliographiques by the Historic Monuments Commission of France to photograph historic buildings, bridges and monuments, many of which were being razed to make way for the grand boulevards of Paris, being carried out under the direction of Napoleon III's prefect Baron Georges-Eugène Haussmann. 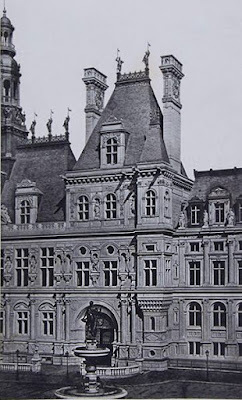 The high quality of his work won him government support for a project entitled Les Villes de France Photographiées, an extended series of architectural views in Paris and the provinces designed to feed a resurgent interest in the nation's Roman and medieval past. 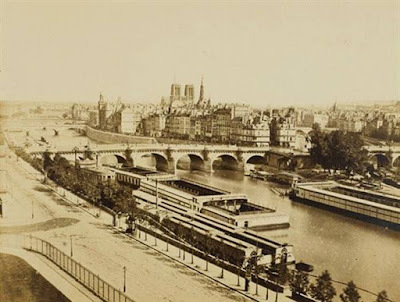 In 1855, Baron James de Rothschild, President of Chemin de Fer du Nord, commissioned Baldus to do a series of photographs to be used as part of an album that was to be a gift to Queen Victoria and Prince Albert as a souvenir of their visit to France that year. The lavishly bound album is still among the treasures of the Royal Library at Windsor Castle. In 1856, Baldus set out on a brief assignment to photograph the destruction caused by torrential rains and overflowing rivers in Lyon, Avignon, and Tarascon. He created a moving record of the flood without explicitly depicting the human suffering left in its wake. He was extremely well known throughout France for his efforts in photography. One of his greatest assignments was to document the construction of the Louvre museum. Baldus used wet and dry paper negatives as large as 10x14 inches in size. From these negatives, he made contact prints. In order to create a larger image, he put contact prints side by side to create a panoramic effect. Baldus was renowned for the sheer size of his pictures, which ranged up to eight feet long for one panorama from around 1855, made from several negatives. Despite the documentary nature of many of his assignments, Baldus was no purist when it came to technique. He often retouched his negatives to blank out buildings and trees, or to put clouds in white skies; in one print from 1851, he pieced together fragments of 10 different negatives to create a composite print of the medieval cloister of St. Trophime, in Arles.